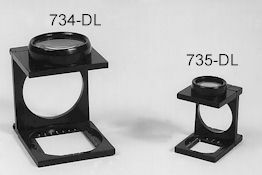 Linen Testers, originally used for counting threads in textiles, are now the most popular general purpose magnifiers used by graphic arts professionals. They are available in a wide range of power and lens types. The 1002 has a 2" x 2" (51mm x 51mm) field of view and a 3.5" focal distance with a 1.5" lens and 4X power. Plastic lens and frame and folds compactly. The 1102 stands 7 1/4" high and has a 4" x 4" (102mm x 102mm) field of view and 3X power. Plastic lens and frame. Folds down compactly. The price of the 1102 is $17.95. Excellent yet inexpensive testers, perfect for imprinting your logo for use as promotional items. They each have a 1" x 1" imprint area. Constructed of lightweight plastic. Inch and mm scales on base. Contact us for imprinting costs and volume discount schedule. The 7549 has a 1.18" x 1.18" (30mm x 30mm) field of view, 5X power, and a price of $8.95. The 7550 has a .88" x .88" (22mm x 22mm) field of view, 8X power, and a price of $7.95. These are our most popular linen testers. Double optically ground and polished glass lens. Black lacquered zinc alloy frame with graduated opening. Folds flat for carrying in pocket with the supplied vinyl pouch. The 734-DL has a 1" x 1" (25.4mm x 25.4mm) field of view, 6X power, and a price of $16.95. The 735-DL has a .5" x .5" (12.7mm x 12.7mm), 9X power, and a price of $12.95. 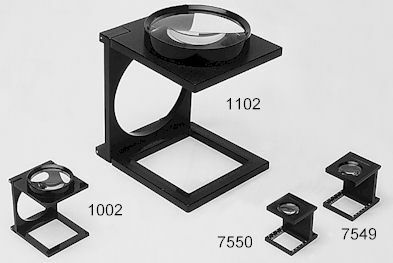 This high quality German made magnifier is available is 5X, 8X, and 10X powers. The lens is biconvex, PXM lightweight plastic. The frame is plastic with a mm scale. This single glass lens tester has a chrome-plated metal frame with a graduated inch and millimeter opening. Comes with vinyl snap-lok pouch. The 728 has a .5" x .5" (12.7 mm x 12.7mm) field of view, 10X power, and a price of $16.95.